Available Now with Full-Color Illustrations! Rise Up! is a loving gift from a powerful spiritual teacher dedicated to the wellbeing of others. It offers “Karmic Cause and Effect,” a process that teaches us to bring lessons from all our lifetimes into the present time; this frees us to create entirely new experiences. By arriving in the Now, we are released to co-create new realities in synchronicity with the Universe. Suzanne has interviewed many important teachers. When I first heard from her in 2016, I didn’t know who she was, even though her work is extremely significant; we almost did not meet. When we did try to get together, I encountered peculiar communication gaffes and lapses of time, signs of interference from negative forces trying to stop us from linking up. I overrode the blocks, and a few days before Christmas 2017, we enjoyed an excellent three-part interview on Revelations of the Aquarian Age, my latest book. I was pleasantly surprised by the scope of her esoteric knowledge and her mastery of my own work. Suzanne is brilliant, determined, and totally dedicated to transformation, even transcendence. I wanted to support her, so I asked her for a copy of Wake Up! But, I had no idea what I was getting myself into! When I got home, I couldn’t put it down and stayed up very late. She led me effortlessly through a ten-day emotional processing system that enables anyone to dump the garbage of a lifetime; just dump the negative experiences that keep us from activating our potential. This workbook is a major contribution in the healing arts, so I reviewed it on Amazon and gave it a five-star rating. She was just finishing the manuscript for her latest book, so I asked her if I could read it and write a blurb for it. Rise Up! takes us on a deep journey through ancient wisdom while examining our place in the Universe. I couldn’t imagine praising it adequately in a few sentences, so I wrote this foreword, my attempt to evaluate it as a contribution to healing ourselves and our world. I am the author of many books exploring new consciousness since the 1980s, and I was also the co-publisher of Bear & Company from 1983 through 2000 when I helped discover many key teachers. I offer this background because I think my work as a publisher qualifies me put Rise Up! in to its proper cultural context. My generation of spiritual seekers, the people born in the late 1930s to the late 1950s, had to use almost all of their energy to break down false paradigms. When I came into my own in the 1980s, human consciousness was left-brain and narrow. Anybody who talked about finding spiritual access, breaking into other dimensions, or transcending time was laughed at. Even though the world had finally gotten past believing God created the world 6,000 years ago and then took Sunday off, the timelines for ancient cultures were far too recent. The anthropological dogma was that humans have been advancing for the last 5,000 years, but why was the human species declining in my time? My generation rebelled and moved the timeline back for human culture deeper into the past. We assessed the meaning of sacred sites and temples all over the planet, and we felt we might have once been more advanced than we are now, whether the archeologists liked it or not. We challenged left-brain science and history and brought forth intuitive knowledge that ended up being verified. We scaled some of the walls of ignorance by the time Suzanne’s generation, people born in the 1960’s and ‘70s, came into their power in the late 1990’s and early twenty-first century. Now it is time for my generation to pass the mantle to them. Like a wilderness fire fighter who has fought too many fires, I don’t have the energy to do what needs to come next: It is time to take the great wisdom that we’ve gathered about our magnificent past into the world and use it to redeem Earth. Earth must be freed from human ignorance so she can “rise up” in all her glory. My generation recovered ancient healing methods and found ways to practice them to free Earth from toxicity, which is often sourced in human anger, guilt, greed, and arrogance. The race to avoid succumbing to cancer, or dying from pollution, heart attacks, and addictions, is a race to a finish we cannot yet see. When I was young, to even suggest using alternative healing or developing greater consciousness was considered insane. 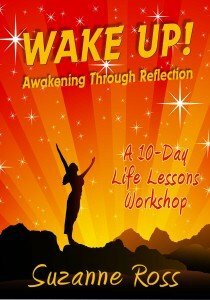 Meanwhile, Suzanne cuts through the resistance and ignorance by saying, “OK, let just do it in ten days!” Her emotional-processing workbook actually does show you how to dump your darkness, pain, and resistance in 10 days! Yet, who would ever dream that she also could create a way for students to ascend to the highest planes, the multiple dimensions that encase us all, in only ten days? Well, she actually has. Dipping into Rise Up!, I assumed it would be a fun journey through the essential esoteric teachings in a complete yet simplistic way. Out went that idea when I realized Suzanne based Rise Up! on the Urantia Book, the 2,000-page tome that journeys through galaxies and universes guided by celestial beings. Speaking of serendipities, I “accidentally” walked into the front office of the Urantia Foundation in 1983 in Chicago when I was in graduate school. It seemed like anybody was welcome, so I sat down with the huge book, read it for many hours, and almost didn’t make it home on time. Even though many of the names and places were very foreign to me, truth rang through the pages. Suzanne was very wise to use it as the background for her ascension workbook, since it is the most advanced esoteric source of recent time, amazing cosmic teachings recorded during 1924-35 by an adventurous group that published it in the 1950s. She weaves the wisdom of many other mystic writers along with the Urantia Book and lifts you up into a deeper connection with nature and to the universal energy all around you. All you have to do is dedicate ten days. The format for this journey is amazing because as she brings you ancient wisdom, esoteric systems, and sacred places, she walks with you in nature, a brilliant idea. This morning, as I was taking a walk while enjoying the aroma of grapefruit blossoms and watching hummingbirds zero in on red blossoms and listening to mockingbirds sing, I realized Suzanne had awakened a deeper connection with nature within me just by having the privilege of reading Rise Up! I didn’t have the time to do the exercises, make notes, and do the meditations, yet just reading it stimulated my senses. My heart connection with everything I was enjoying was so much deeper, and the air and water was shimmering, vibrating with subtle angelic frequencies that were reaching for me. Thank you Suzanne. What a gift from such a gifted writer! Suzanne accomplishes this by firmly grounding the high esoteric wisdom in the matrix of nature, life expressing itself through many dimensions. So, when she takes you for a walk on the beach and you encounter sand dollars and nautilus shells, you are stunned to see that their shapes and designs are fifth-and-sixth dimensional as if they exist to awaken our inner knowledge of sacred geometry. Hearing birds singing as Suzanne walks with you in the forest accesses your inner seventh-dimensional sound codes, then eighth-dimensional divine light floods your pineal gland. Just being on these journeys with her while contemplating her beautiful art selection activates all of your inner higher-dimensional codes. Based on my nine-dimensional model in The Pleiadian Agenda and Alchemy of Nine Dimensions, I’ve taught students how to activate these dimensional codes for twenty-five years. We have advanced so far! Suzanne takes you directly into the zones of living wisdom in nature to activate your inner multidimensional knowledge. With these ideas in mind, now we have to ask how we are going to move beyond wars, desperate migrations, resource depletion, pandemics, and starvation. The answer is actually in this book. Let us remember that we create with the dimensional fields of Earth; we create the dilemmas I just listed above. We’ve become overwhelmed by these toxic creations because we haven’t taken responsibility for creating them and allowing them to continue. The only way out of this conundrum is to purge the negative fields; then activate the creative fields you really want with love in your hearts and intelligence in your minds. This book teaches you how to do it—and fast! After 75 years of loving and serving Earth to pass the wisdom I’ve found, my own worries are gone because Suzanne Ross and others like her are carrying on. If she could write a book like Rise Up! totally grounded in nature, then I can hope our species will rise up and transcend, humans remembering they are the Keepers of Earth. 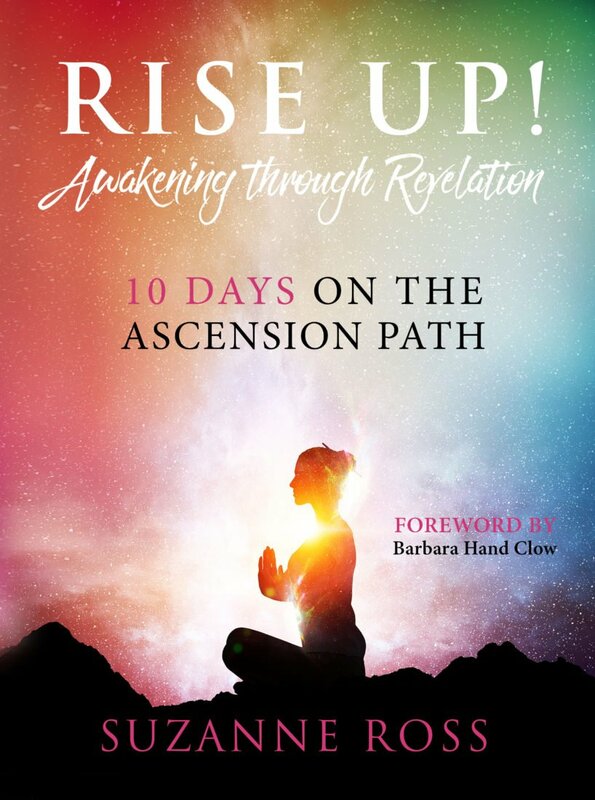 Barbara Hand Clow is the author of Alchemy of Nine Dimensions with Gerry Clow, Revelations of the Ruby Crystal, and Revelations of the Aquarian Age. "I have finished reading "Wake Up!" and it is one of the finest books on personal transformation I have ever read. You say so much in so few words. It is a masterpiece. Thank you so much for giving it to me! This email is to tell you I am sure I will endorse your second book as soon as it arrives and I have read it. You are a wonderful and clear writer, and your heart is so much present in your work that I could almost hear it while reading it." With her advanced knowledge of health and wellness, Suzanne has empowered hundreds of people to reach their highest potential through improved health and wellness. Not only has she helped them improve the quality of their life from a physical perspective but, through sharing her enlightened message, has inspired many to realize their potential from a spiritual perspective as well. By offering “The Up! Trilogy”, Suzanne is expanding her live 30-day programming by bringing it into the lives of many with her interactive books, guided meditation CD and “Spiritual Transformations” DVD. She hopes that her message of human empowerment and "Creator-Consciousness" will transform the lives of those seeking to manifest a reality that aligns with their true purpose. Through teaching her signature "VIS-MED" practice from her book "Wake Up!" she guides her students through sensory visualization and contemplative meditation facilitating their power to connect to higher consciousness. She believes that anyone can dramatically enhance their experience of life by tapping into the greater field of consciousness that lies beyond our everyday awareness. This connection, she feels, not only reveals a deeper meaning and greater purpose but also empowers seekers to unleash their creative spirit and realize their unlimited potential to do, be and have anything their heart truly desires. Through her work, Suzanne emphasizes the importance of pure intention and the need to bring the highest virtue into every thought, word and action. She encourages her students to practice forgiveness, patience and compassion and encourages them to radiate love and light in every moment of their life. The response to this approach has been overwhelming and her students have shared many testimonials claiming that their experience of life has been transformed dramatically and their relationships enhanced in many profound and positive ways. 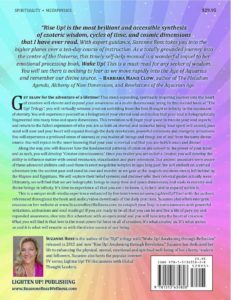 It was due to these testimonials that Suzanne was inspired to bring her program to life on the pages of a book that could empower and enhance both the individual and collective consciousness. She expresses deep gratitude to all who join her on this journey. As an expression of her gratitude, she offers free audio/video downloads for Dynamic Movement, Inspirational Breathing and VIS-MED meditations under the Meditations tab in this website!hope her readers will unite through her website. 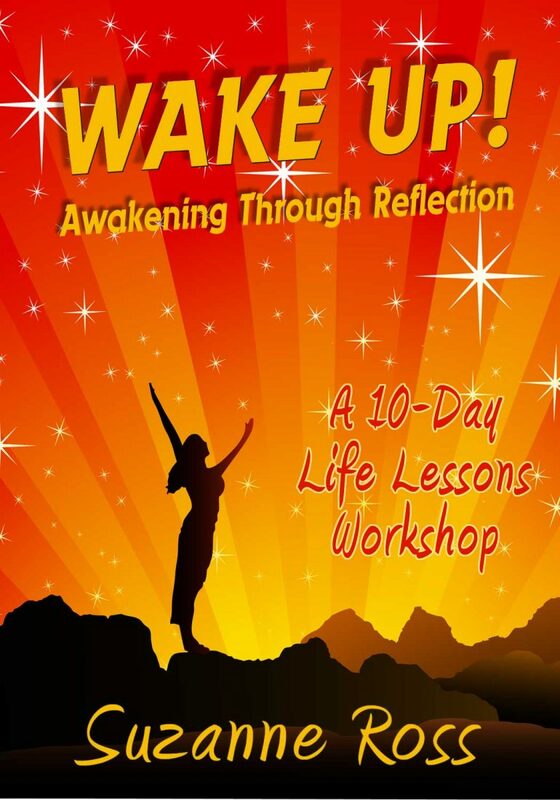 Through the cathartic workshops offered in her book "Wake Up!" and the companion online workshops, she aims to elevate the minds and open the hearts of her readers, fans and followers. Her ultimate goal is to offer humanity powerful ways to "live well and love life" by accessing their highest consciousness. I am blessed to have found my true calling in the field of wellness. It has given me the opportunity to improve the lives of hundreds of people over the last 20 years. Helping others realize what they are truly capable of has been extremely gratifying. For most of my career, I have been primarily focused on the physical well-being of my clients but have always made a sincere effort to uplift them on an emotional level as well. Giving positive feedback and helping my clients have a brighter and more optimistic perspective, especially when faced with difficult challenges, has been the most fulfilling aspect of my career. Over the last five years, I have taken this to a whole new level. I began a spiritual quest as the result of a life-changing experience and as I did, my clients began to notice a marked change in my attitude and outlook on life. I gradually became more calm, patient and joyful and as they watched my transformation, they took an interest in my journey. Responding to their inquiries, I shared with them how my spiritual practice was bringing me a profound sense of peace. Several of them asked if I would consider guiding a weekly meditation. Due to their enthusiastic response and heightened interest in spirituality, I became inspired to share my personal revelations with others. I wanted everyone, my clients, friends and family, to experience the same feelings of pure joy and inner peace that I had discovered along my path. When you start to see the world from a more enlightened perspective, you want to share it with everyone! It comes from a place of love and compassion for all of humanity. The bliss is so profound that you want others to realize it as well. I was inspired by a powerful motivation to bring this full realization forth so others could benefit from it as well. Find Suzanne on Facebook! Click here!